Surrounded by 60 people, ninjutsu practitioner Nachum Kaplan knelt with his eyes closed, too nervous to breathe. The master stood behind him with a training sword, ready to cut down with killer intent. Ninjutsu students Rusydi Khairul (left), a 26-year-old public servant, and Lal Rin Lian, a 27-year-old mechanical engineer, tossing their shurikens or “ninja stars”, which are made of wood and rubber, at a standing target after executing a roll. The students are drilled on executing a fluid movement of rolling and retaining composure to deliver a strike, which can be a punch or tossing of an object in the modern context. “You have to sense the cut is coming and roll out of the way to avoid the cut to pass,” explained the 43-year-old, whose day job is as a financial journalist. As bizarre as it sounds, that was part of the Ninja Godan Test he took in 2012. Done only in Japan, the test, which challenges one’s senses and situational awareness, is conducted under the eyes of ninja grandmaster Masaaki Hatsumi. 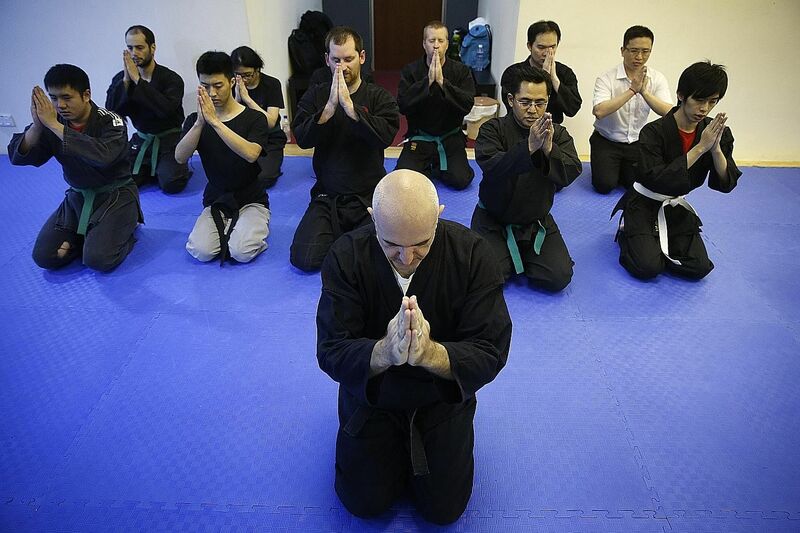 Mr Nachum Kaplan (foreground), 43, who started the Singapore Ninjutsu martial arts school in 2007, opens and closes each class with a ceremonial bow and chant that reminds practitioners to keep themselves open to new learning. “I calmed myself and slowed my breathing, and the next thing I knew, everyone was clapping as the cut had come down and I had avoided it,” he said. (Above) Ms Tong Hui Wen, 25, who has been practising ninjutsu for five years, goes for her sparring partner’s face to get out of a headlock, while other students practise their “kamae”, or postures, which provide a basis for the proper execution of moves. Ninjutsu is a martial art – not a sport – and it is not confined by rules when it comes to combat situations. Mr Kaplan passed the test to earn a fifth-degree black belt and full instructor’s licence. Unlike martial arts such as judo or taekwon-do, ninjutsu is not a sport, and is not confined by rules. Ninjutsu includes striking, grappling, locking, choking, throwing, ground fighting and an array of weapon skills. Ms Tong Hui Wen, 25, who has been practising ninjutsu for five years, goes for her sparring partner’s face to get out of a headlock, while other students (above) practise their “kamae”, or postures, which provide a basis for the proper execution of moves. “We prepare for a situation where there are no rules, no referees, no gloves, where an opponent may be armed or there may be more than one opponent,” said Mr Kaplan, who is a Singapore permanent resident. He founded the Singapore Ninjutsu martial arts school in 2007 as a junior instructor when he came over from Australia. “Ninjutsu is a set of skills to help you survive, not win a tournament,” he said. From a mere one or two students taking private lessons from him in the early days, Mr Kaplan has since established a dojo (martial arts school in Japanese) of almost 50 students in a Telok Blangah shophouse. Ninjutsu student Lal Rin Lian uses a shuriken to distract his opponent – a common tactic that seeks to buy a practitioner sufficient time to take out his attacker – as he delivers a surprise kick during training. 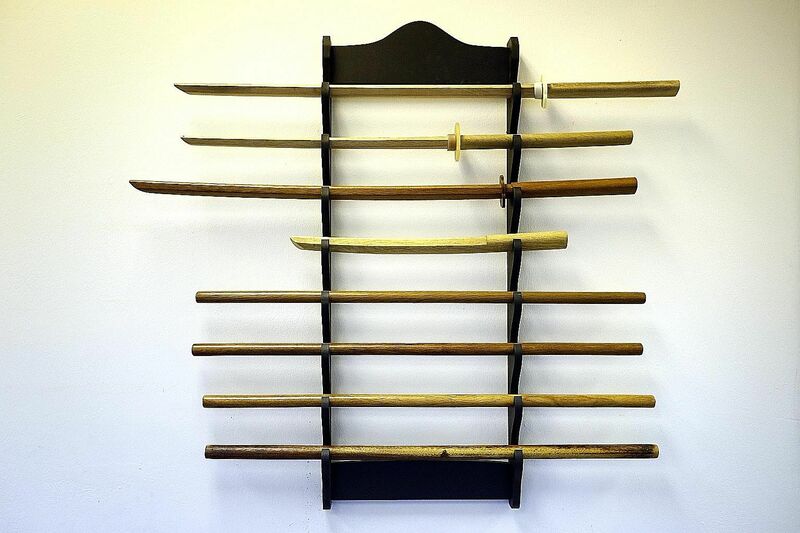 Besides striking, grappling, locking, choking, throwing and ground fighting, ninjutsu includes a variety of weapon skills, including using the wooden katana and shuriken (above). 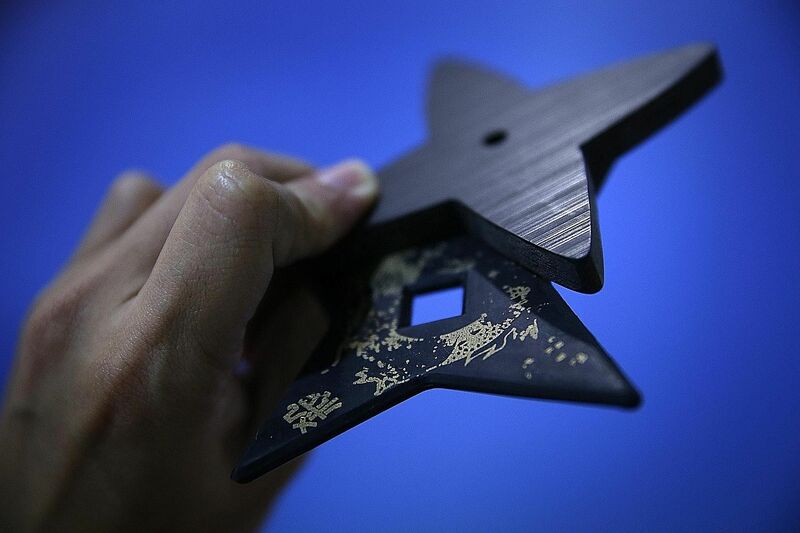 For training purposes, wooden and rubber shurikens are used as real bladed shurikens are prohibited in Singapore. There are five evening classes on weekdays and two morning classes on Saturdays. For Mr Graham Jones, a 33-year-old American reinsurance broker working in Singapore, taking the occasional hit to the face is part and parcel of training. “It’s about not getting shocked by the pain, dealing with it and continuing to stay safe,” said Mr Jones, who has been training with the dojo for eight months. “We’re learning how to fight to survive and when someone on the street attacks me, I know how to react,” he added. (Above) Ninjutsu student Lal Rin Lian uses a shuriken to distract his opponent – a common tactic that seeks to buy a practitioner sufficient time to take out his attacker – as he delivers a surprise kick during training. 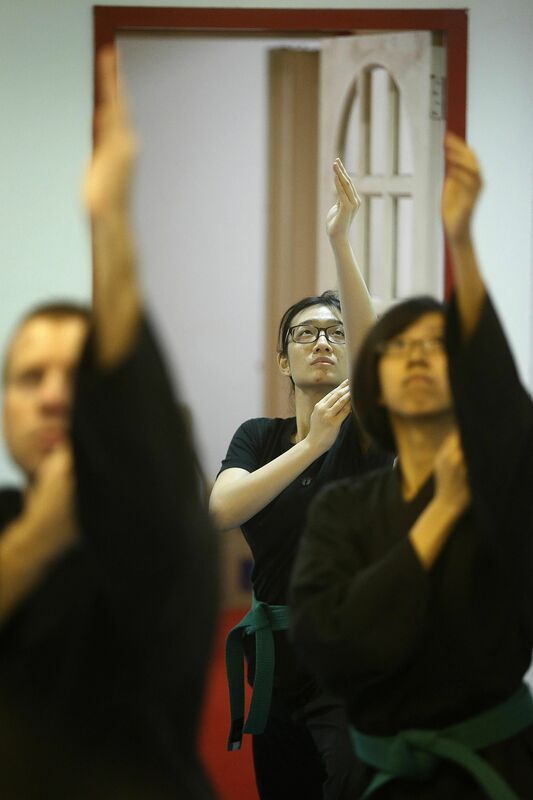 Besides the motivation of self-preservation and defence, being skilled in ninjutsu has honed the balance of 25-year-old undergraduate Tong Hui Wen, which she puts to use in daily situations. “Sometimes, the MRT rides can be quite jerky. When the train stops abruptly, most people would lose their balance and fall,” said the final-year biological science student from Nanyang Technological University. “I shift my body weight subtly. Bend my knees, feet hip-width apart and I’m balanced during the ride,” added Ms Tong. Ninjutsu student Lal Rin Lian uses a shuriken to distract his opponent – a common tactic that seeks to buy a practitioner sufficient time to take out his attacker – as he delivers a surprise kick during training. Although she has a black belt in taekwon-do, Ms Tong has committed her time to practising only ninjutsu with Mr Kaplan’s dojo for the last five years. While ninjutsu is generally defined as unconventional warfare tactics and espionage practised by a ninja in feudal Japan, these students are under no illusion that they will emerge from the dojo to scurry about on rooftops.